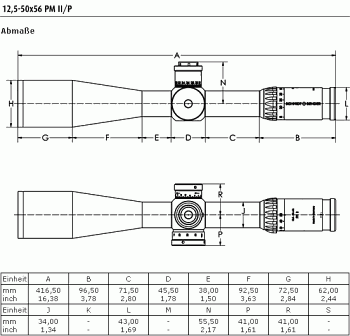 Note: S&B also lists an exit pupil size range of 13.3 to 3.3 mm. The smaller number doesn’t seem right, unless S&B has achieved a major breakthrough in optics design. At max 50X power, with a 56mm front objective, we calculate the minimum exit pupil as 1.12 mm. *We also question the stated weight of 610 grams. 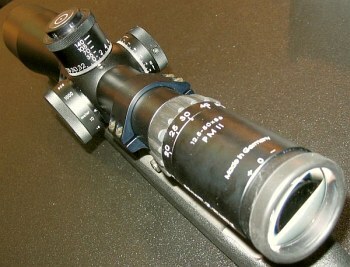 The 12.5-50X56 S&B Field Target Scope, which is similar in size and features, is listed at 1150 grams or 40.56 ounces. The scope description states: “The sight is alternatively available with foreseeing in the 1st plane or 2nd plane.” By this we think it means BOTH first-focal-plane reticle and second-focal-plane reticle versions will be offered. 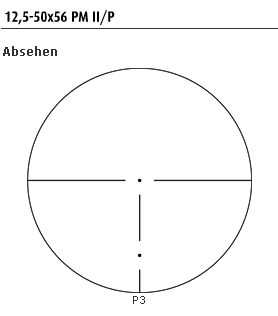 On a variable power scope, a first-focal-plane reticle increases or decreases with the power setting, so the reticle always appears the same size relative to the target. When the reticle is in the second focal plane, the reticle stays a constant size as the image increases or decreases in size with the power setting. We still have no concrete information on scope price or availability in the USA. We’ve heard the figures $2700-2900 tossed around, but S&B representatives won’t give out hard numbers. Keep in mind that the 12.5-50 is NOT illuminated so it could actually be a little cheaper than the 5-25×56 PMII with illuminated reticle. 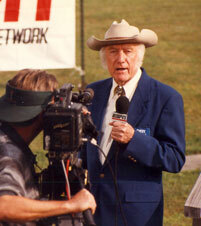 Share the post "Tech Info for Schmidt & Bender 12.5-50×56 Scope Now Available"
Text COPYRIGHT © 2008 by National Shooting Sports Foundation, Inc.
Share the post "Grits Gresham, Host of American Sportsman, Passes Away"